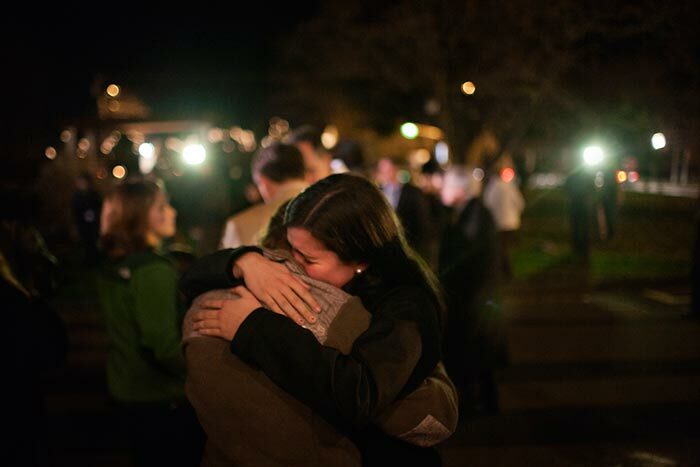 Grief in Newtown The December 2012 mass shootings at Sandy Hook Elementary School, in Connecticut, has reinvigorated the gun control debate. My mother’s family arrived in Watertown, Massachusetts, in 1633 in the figure of John Prince, a Puritan fleeing Britain. My father’s family landed with William Hedges, also a Puritan refugee and a tanner, in East Hampton, New York, in 1650. As time passed, the huge tributaries of these two families intersected with every major event in American life. They were present for the massacre of Indians on western Long Island. Because the Indians drew their myths, mores, and values from the wilderness, they held beliefs that were antithetical to the Puritans’ rigid, controlling convictions. They were said to be in league with Satan, so the Europeans tried to annihilate them. My forebears produced soldiers, sea captains, farmers, a few writers and scholars, and a smattering of political leaders who ascended to governorships. By the time of the Civil War, the family included a Union general on one side and a Confederate spy on the other. A couple of my ancestors took part in the brutal Indian wars. One was an scout for General Philip Sheridan on the western plains; he was murdered by Sioux warriors, a fate he appears to have deserved, given the drunken, murderous rampages against Indian encampments he describes in letters home to Maine. Others were sober, dour-looking Anglican ministers, teachers, and abolitionists. A distant relative of my father’s family became the largest landowner in Cuba after 1898, when it was seized from the Spanish; some of this family’s descendants worked with the CIA in the fight against Fidel Castro, in the waning days of the Cuban dictatorship. My maternal grandfather, who worked most of his life in a small-town post office, served as a master sergeant in the Maine Army National Guard in the 1930s. He and other guardsmen regularly waded into the crowds of striking textile and mill workers to violently break up labour unrest. He kept his army-issued truncheon in his barn; it had twenty-three small nicks he had made with his penknife. “One nick,” he told me, “for every communist I hit.” My father and most of my uncles fought in World War II; and one uncle was severely maimed, physically and psychologically, in the South Pacific. I was in Central America in the 1980s during the proxy wars waged by Washington. I accompanied a Marine Corps battalion as it battled Iraqi troops into Kuwait during the first Gulf War. Violence, at home and abroad, has been a constant in America. The gun culture Canadians and Europeans find hard to fathom is its natural expression. There are some 310 million firearms in the United States, including 114 million handguns, 110 million rifles, and 86 million shotguns. There is no reliable data on the number of military-style assault weapons in private hands, but the working estimate is about 1.5 million. The United States has the highest rate of gun ownership in the world—an average of ninety per 100 people, according to a 2007 Small Arms Survey. By comparison, Canada has thirty-one per 100 people. An estimated thirty Americans are killed with a gun every day. Canada rarely tops 200 gun-related homicides a year. The lives of my ancestors and the experiences they endured, as well as my own life, chronicle the nation’s persistent and savage addiction to firearms. Violence in America is primarily vigilante violence, used most often to crush dissent, to keep a repressed minority in a state of fear, or to exact revenge on those the state has branded as traitors. It is a product of hatred, not hope. It is directed against the weak, not the strong. The slave patrols and the Ku Klux Klan that terrorized blacks; the Pinkertons and the gun thugs who shot dead hundreds of workers and wounded thousands more in the bloodiest labour wars in the industrialized world; the anti-communist Cuban exile groups that waged a reign of terror against fellow Cubans in Miami—all of these are expressions of a long history of mob-led violence that is tolerated, and often encouraged, by the ruling elite. So it is that even after twenty first-graders and six adults are gunned down in a Connecticut elementary school in December 2012, the US Senate cannot pass legislation imposing stiffer background checks on gun purchasers, nor a ban on assault weapons. Since the Newtown massacre, over 5,000 people, including more than 100 children, have been shot dead in random acts of violence. But Newtown, like the mass shootings at a movie theatre in Aurora, Colorado (twelve dead), at Virginia Tech in Blacksburg (thirty-three dead), at the immigration centre in Binghamton, New York (fourteen dead), and at Columbine High School in Littleton, Colorado (fifteen dead), has no discernible effect on mitigating our gun culture. The state has never opposed the widespread public ownership of guns, because these weapons have rarely been deployed against it. In this, the United States is an anomaly. It has a heavily armed population and yet maintains remarkable political stability. We are not a people with a revolutionary tradition. The War of Independence, while it borrowed the rhetoric of revolution, merely replaced a foreign oligarchy with a native, slave-holding oligarchy. The founding fathers were deeply conservative; the primacy of private property, including slaves, was paramount. To thwart popular will, the framers of the Constitution established a series of mechanisms, from the Electoral College to the appointment of senators, buttressed by the disenfranchisement of African Americans, women, American Indians, and the landless. George Washington, probably the wealthiest man in the country when the war was over, shared exclusive economic and political power with his fellow aristocrats. This distrust of popular rule among the elite runs like a straight line from the Federalist Papers and the Constitutional Convention to the 2000 presidential election, where the Democratic candidate Al Gore received over half a million more popular votes than the Republican George W. Bush. Revolution is not in our blood. The few armed rebellions—the 1786 and 1787 Shays’ Rebellion, the 1921 armed uprising by 10,000 coal miners at Blair Mountain in West Virginia—were swiftly and brutally put down by a combination of armed vigilante groups and government troops. More importantly, these rebellions were always local. They were never about anything more than specific grievances. For example, the miners at Blair Mountain, who held off armed militias for five days, wanted only the right to organize unions. The universal, radical ideologies and utopian visions that sparked revolutions in Russia or Germany after World War I are foreign to our intellectual tradition. The United States has never produced a great revolutionary theorist, no Alexander Herzen, Karl Marx, Friedrich Engels, Vladimir Lenin, Rosa Luxemburg, or Antonio Gramsci. Our greatest radicals are either anarchists—Randolph Bourne, Emma Goldman, Noam Chomsky—or advocates for oppressed minority groups: Frederick Douglass, Susan B. Anthony, W. E. B. Du Bois, Malcolm X, Cornel West. The closest America came to a genuine revolutionary was Thomas Paine, although he was British by birth. While useful to the aristocrats who wanted to supplant the British during the war, he was ruthlessly persecuted when it was over, especially after he published an open letter in 1796 to George Washington that read, “The world will be puzzled to decide whether you are an apostate or an impostor; whether you have abandoned good principles, or whether you ever had any.” When Paine died, only six people—two of whom were black—attended his funeral. There will never be serious gun control in the United States, and not only because its violence is usually vigilante violence. White people, who have enslaved, lynched, imprisoned, and impoverished black people for generations, are terrified that those they have subjugated will seek revenge. As the nation circles the drain, as the economy implodes and climate change brings with it apocalyptic weather patterns, white Americans, who are becoming a minority, cling to their assault weapons with even greater ferocity. (Guns are readily available to white people, but for African Americans, especially those in our impoverished inner cities, gun ownership is largely criminalized.) 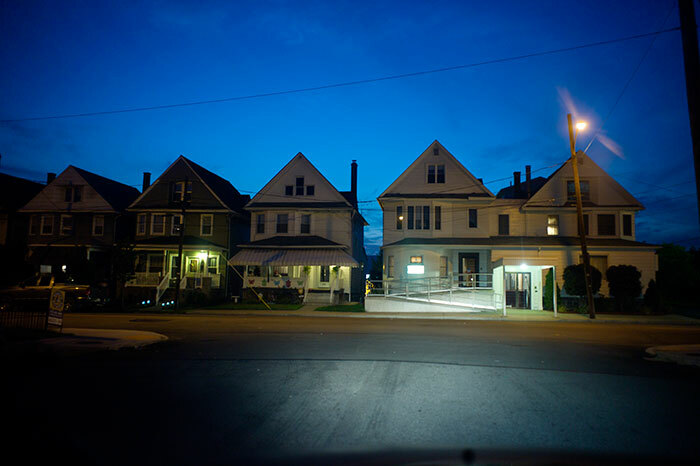 The dark ethic of right-wing militias, the Tea Party, the lunatic fringe of the Republican Party, the National Rifle Association,and the survivalist cults is that the gun will keep the home and family from being overrun by the crazed black hordes who will escape from their colonies in our urban slums. The mother of Adam Lanza, who carried out the Newtown massacre, was a survivalist, stockpiling weapons in her home for impending social and economic collapse. Scratch the surface of the survivalist cult in the United States, and you expose white supremacists. The pattern of violence, and especially vigilante violence, makes the United States a very different country from Canada and the nations of western Europe. It means that as internal stability unravels, we will respond in a different way. The breakdown of American society will trigger a popular backlash, a glimpse of which we saw in the Occupy movement, but it will also energize the armed vigilantes. The longer we remain in a state of political paralysis, dominated by a corporate elite that refuses to respond to the mounting misery of the bottom third of the population, the more the rage of the underclass will find expression through violence. If it remains true to the American tradition, this violence will not be directed at the power elite but will single out minorities and scapegoats. Gabrielle Giffords, a member of the House of Representatives, was shot in the head in January 2011, as she held a meeting in a supermarket parking lot in Arizona. Eighteen other people were wounded, and six of them died. Sarah Palin’s political action committee had previously targeted Giffords and other Democrats with crosshairs on an electoral map. Giffords’ opponent in the House election had hosted a campaign event with the call to action “Get on Target for Victory in November. Help remove Gabrielle Giffords from office. Shoot a fully automatic M-16 with Jesse Kelly.” The use of violent rhetoric, a staple of the right wing, feeds the demented visions of desperate men and women who have easy access to weapons. We have avoided the genocidal rhetoric of those who call for the wholesale extermination of a race or a class, but we are not far from it. The longer the economy stalls, the more the poor and working classes feel trapped and are unemployed or underemployed, and the longer that political paralysis makes the state unable to respond, the closer the country comes to a full-blown confrontation. Muslims, undocumented workers, homosexuals, liberals, feminists, intellectuals, and African Americans will all become targets. Disdain for traditional liberal institutions will be replaced by a call for their eradication. As the nation deteriorates economically and morally, the last refuge for self-respect will be found in the hyper-masculine values of military chauvinism, violent retribution, and a mythic past. There is a disturbing attempt under way in the southern United States to rewrite the history of the South, a desperate retreat by beleaguered whites, battered by a flagging economy and few prospects, into a mythical self-glorification. I witnessed a similar retreat into self-delusion during the war in Yugoslavia in the 1990s. As the country’s economy deteriorated, Serbian, Croatian, and Muslim ethnic groups built fantasies of a glorious past that became a substitute for history. The ethnic groups vomited up demagogues and murderers such as Radovan Karadzic and Slobodan Milosevic. They sought to remove, through exclusion and finally violence, competing ethnicities to restore a mythological past. The embrace of non-reality-based belief systems made communication among ethnic groups impossible. They no longer spoke the same cultural language. There was no common historical narrative built around verifiable truth. This mythology of the past is being replicated in many parts of the United States. Flyers reading “Loyal White Knights of the Ku Klux Klan Wants You to Join!” appeared in residential mailboxes in Memphis in early January. Later that month, the Klan distributed pamphlets in a suburb of Atlanta. Last year, the governor of Tennessee declared July 13 Nathan Bedford Forrest Day, to honour the birthday of the Confederate general and first leader of the KKK. There are thirty-three historical markers commemorating Forrest in Tennessee alone. Montgomery, Alabama, which I visited a few months ago, has a gigantic Confederate flag north of the city, planted there by the Sons of Confederate Veterans. Confederate monuments dot the city centre. There are three Confederate holidays in the state, including Robert E. Lee/Martin Luther King Day. Florida, Georgia, and Mississippi also officially acknowledge Lee’s birthday. Jefferson Davis’s birthday is recognized in Alabama and Florida. And re-enactments of Confederate victories in the Civil War crowd Southern calendars. The rise of ethnic nationalism over the past decade, the replacing of history with mendacious and sanitized versions of lost glory, is part of the moral decay that infects a dying culture. Myth breeds intolerance and eventually violence. Violence becomes a cleansing agent, a way to restore a lost world. Ample historical records disprove the myths espoused by the neo-Confederates, who insist the Civil War was not about slavery but about states’ rights and the protection of traditional Christianity. However, these records are useless in puncturing their fantasies, just as documentary evidence does nothing to blunt the self-delusion of Holocaust deniers. Those who retreat into fantasy cannot engage in rational discussion, for fantasy is all they have left of their tattered self-esteem. When their myths are attacked, rather than a discussion of facts and evidence, it triggers a ferocious emotional backlash. The challenge of the myth threatens what is left of hope, and as the economy unravels, as the future looks more and more bleak, myth gains in potency. What Canadians struggle to grasp is that the language of violence is our primary form of communication. We have built within us a belief that we have a right, even a divine right, to kill others to purge the earth of evil. We do this in Iraq. We do this in Afghanistan. We do this in Pakistan. We have always done this. The many millions of corpses the American empire has left behind, from three million Vietnamese to millions of American Indians, loom like Banquo’s ghost over the declining empire. The core faith of the United States is not found in the Gospels—which have been perverted to fuse the iconography of Christianity with that of the state to sanctify the nation—but in the satanic lust of purification through violence. We have carried out bloodbaths on foreign soil and on our own land for generations, in the vain quest for a better world. The worse it gets, the deeper our empire sinks under the weight of its own decay and depravity, the more we question and deeply fear losing our identity as imperial masters, the quicker we will be to reach for the gun.